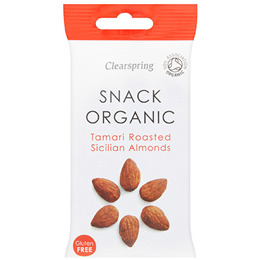 Enjoy the naturally delicious flavour of the highest quality, organically grown Sicilian almonds with organic Tamari soya sauce. Roasted to perfection in small batches by Clearspring`s craft producers in Austria. Enjoy as a healthy snack or with desserts. Although every care has been taken to remove shell fragments, some may remain. Below are reviews of Clearspring Organic Tamari Roasted Sicilian Almonds - 30g by bodykind customers. If you have tried this product we'd love to hear what you think so please leave a review.